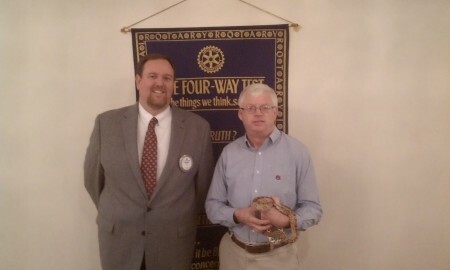 At the Auburn Rotary Club's August 14 meeting, Dr. Jim Armstrong with the Auburn University Extension program spoke on Snake Identification and Control. He reported that there are 6 deadly snakes of the 43 species present in Alabama. He presented the characteristics of the 6 and how to identify them. Dr. Armstrong humorously pointed to "common sense" methods of control and avoidance. Linda Penrod-Brandt was also honored as a Paul Harris Fellow in honor of her late husband and Rotarian Jim Brandt, and was the first member of the audience to bravely handle the snake that Dr. Armstrong brought with him to his presentation.